Keep your stove looking its best with Stove Bright Black Gas Appliance Firebox Paint - 43400. Proper painting prevents rust and promotes the longest life possible for your stove and its parts. 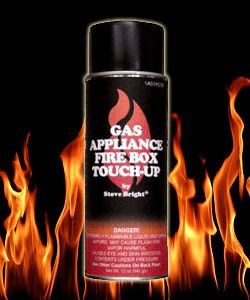 Keeping your stove maintained with Stove Bright Black Gas Appliance Firebox Paint - 43400 will guarantee that you'll get the most out of the life of your stove. Is this product a flat black? This is indeed a flat black paint. Can I use this on my indoor stove grates? Can I use this paint for the inside bricks of an old wood fireplace? Some are stained with soot, and the others are yellow. We have just installed gas logs and have been told no paint can withstand the heat. Thoughts? You would be able to paint the inside of your masonry fireplace with any of the 1200 degree high temperature paint we offer without issue, however, frequent re-painting of the brick is typically be necessary. Masonry brick holds moisture which will cause the paint to bubble and flake away over time. I don't know if you've considered this option already, but we do offer several products made for cleaning your existing brick like this Non-Toxic Brick and Stone Cleaner. I have a vintage cast iron gas heater with ceramic bricks. Can I use any of your paints to paint the cast iron parts? So long as the parts you are painting are not coming in direct contact with flame, that should be no problem at all. Can this be used on a metal wood burning firebox? There should be no issue with painting any exterior surfaces that may need re-painting, but the interior of any wood burning fireplace should not be painted. None of the paint we offer should ever come into contact with direct flame or be exposed to the temperatures inside the combustion chamber of any wood burning hearth system. Will this product adhere to galvanized metal? I would like to use it on a draft diverter vent for an old floor furnace. Yes, it will work on Galvanized metal. Will this work on the inside of a gas fireplace box? Yes, it can be used inside the firebox. How long after you spray this product on your firebox do you have to wait until you have your first fire? This will dry in about 20 minutes. After this, you should wait 4 hours before igniting your first fire. Once lit, you should moderate the gas for a low burn for 10 minutes, then increase the gas setting to a medium level for 60 minutes. Lastly, increase the setting to the highest level to burn as hot as possible for 60 minutes. Can I use this Stove Bright black gas appliance firebox paint to paint the inside of the firebox of a gas fireplace? Is there any potential hazard that I should be aware of? This paint can indeed be utilized to paint the interior of a fireplace. 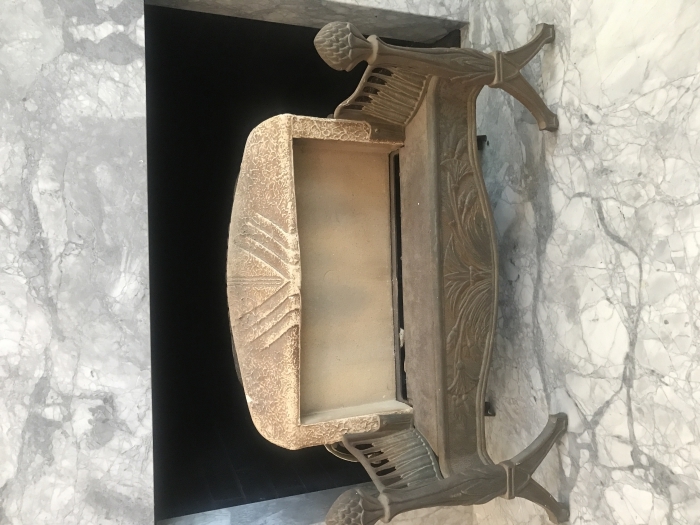 The curing process will give off a slight odor during the initial firing of the fireplace, but the odor will dissipate after a short amount of time. Can this paint be used on a brick firebox of a wood burning fireplace? This paint should only be used for this purpose if the wood burning fireplace will no longer be used. Temperatures in a wood fire can get high enough that the paint will begin to discolor and will eventually flake. If the firebox will continue to be used, the inside should be resurfaced with a thin parging mix. Will this work to paint the brass surround on my fireplace? Will I need to prime or prep the surface in anyway? Yes, our high-heat paint is suitable for this application. We have a wide selection of colors in our stove and fireplace paint section. Will this paint repair the inside of my fireplace? Do I need to do anything else to fix it? The black appliance paint you are viewing would be an excellent product to touch up the exposed metal. It is likely that the paint will continue to flake and as such, I recommend using a paint thinner to completely remove the paint along the top shelf. After removing the paint completely, this component can be repainted with the new appliance paint. Can this be used to paint the brick inside a gas fireplace? Yes, this paint is suitable for use inside a gas firebox. Please note that this will not withstand direct contact with flames, however. Is this the kind of paint used to paint the rock on the bottom of a gas fireplace? This paint is indeed intended for use inside the firebox of a gas fireplace. I taped off everything inside and around the fireplace that I did not want painted, and covered the front with plastic, leaving an overlap that I could stick my hand with the paint, then started spraying! The paint "floats" less than regular paint, and was easy to keep on the surfaces that I intended. We will see how it stands up when I use my fireplace this winter. It looks great! Fast delivery, Good coverage. Didn't need multiple coats. A bit pricey, but in the end, I am glad I purchased this and I would highly recommend it. ProsDon't need to keep spraying. One coat usally does the trick.